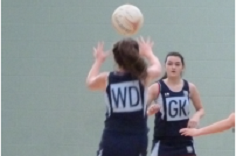 An important aspect of school life in Notre Dame is the range of extra-curricular activities provided for our pupils. We consider these to be an important element in our pupils’ education. Staff and pupils are encouraged to participate fully in all aspects of life outside of the classroom. Under-13s, Under-14s, Under 16’s and senior teams are entered in the Paisley and District league. Under- 13, Under-14, Under-16 and Under-18 teams are all entered in the Paisley & District St Mirren cup and Scottish Cup competitions. Pupils are given the opportunity to experience a variety of athletics events. The school takes an active part in cross-country, track and field (indoor and outdoor) and sports hall athletics. A number of our pupils have represented Inverclyde district and Renfrew area. Club meets Tuesdays after school. We have 1st Year, 2nd Year and Senior teams competing locally and nationally. We have several pupils who have earned international caps in various age groups. This is now a major part of the PE curriculum and After-School instruction is available for the large number of talented dancers we have in the school. We also have several pupils who are now dance leaders which allows them to lead dance sessions with our feeder primaries. Indoor golf has proved to be very successful with a large number of pupils participating. We have recently secured lottery funding to buy new equipment and hopefully make golf more accessible to pupils. Through the introduction of the rugby club, we now have an S1 and S2 team as well as an S3 and S4 team. These teams are taking part regularly in the School sports competition and are improving with every game. This has become very popular with a large number of pupils participating at lunchtime. S1/S2 Basketball is taken on Thursday lunchtime by active schools. This allows pupils a taster of what’s to come in their curriculum later in the year. This has recently been introduced to the Extra- Curricular programme because of its popularity with pupils. The Music Department in Notre Dame is a very active department and offers a wide range of extracurricular activities. The school week is jam-packed with different musical ensembles and we have well over 150 students taking part in our groups. The department also enjoys close links with Software Training Scotland who run sound recording and production classes for S1-S6 students. These run for a 10 week block each year, inspiring all of our future music producers! Every year our musical groups work extremely hard to provide the entertainment at the School Awards Night, a very important and prestigious event in the School Calendar. 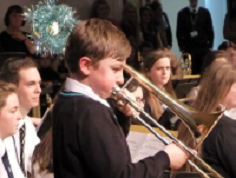 At Christmas time, the department puts on a fantastic concert which showcases the talents of our super students! Last year, through our Christmas Concert and other fundraising activities, we helped to raise thousands of pounds for charity. This is very important to the students as it allows them to use their talents to help those who are less fortunate than themselves. The department also works incredibly hard to prepare for performances at the Inverclyde Music Festival. Our students, while also enjoying many individual successes over the years, are absolutely delighted when some of our larger ensembles, such as the School Orchestra, Concert Band, Senior Girls’ Choir, Stage Band, Junior Choir and Junior Band beat off stiff competition and are awarded ‘First in Class’ in their respective categories! We typically can have over 120 entries in different classes in the festival. Within Inverclyde Authority, there are many award-winning and very well respected musical groups such as the Inverclyde Schools’ Junior and Senior String Orchestras, Concert band, Junior and Senior Choirs and the Inverclyde schools Wind Orchestra. Many of our pupils take part in these groups and very much enjoy working with young people from all over Inverclyde as well as from their own school. At Christmas time, the department is in great demand and in addition to our Christmas Concert, we go out and perform to many of the Residential Homes and Day Centres in our local community. This is an extremely important experience for our young people and one which allows them to share their talents with others. It also helps them to develop into responsible citizens who contribute immensely to their local community. In the last four years, our Senior Concert Band have visited and performed at our associated and neighbouring primaries. We hope you enjoyed our performances and that you will recognise a few familiar faces when you come to Notre Dame. Every year at Christmas time, Notre Dame puts on its first dramatic production of the year, our school Pantomime. Pupils from S1, S2 and S3 rehearse very hard every week to put on five performances for the public – three public performances in the evening and two performances in the afternoons for primary schools, crèches and other charity groups. This year’s pantomime was ‘Aladdin’ and it was written by our exceptionally talented former Head Boy, Ruairidh Forde. In recent years we have performed ‘Jack & The Beanstalk’, ‘Snow White & The Seven Dwarves’, ‘Sleeping Beauty’, ‘Pinocchio’, ‘Beauty and the Beast’, ‘Mother Goose’ and Cinderella– this year’s cast of ‘Aladdin’ have also been able to put on a performance worthy of Notre Dame’s outstanding reputation for productions. Our cast relish performing alongside a live band which is made up entirely of pupils, former pupils and staff. Notre Dame has a long and distinguished history of putting on Musical Theatre productions. The school show involves extensive rehearsals each week from February till June and these rehearsals increase as the show approaches. Our dramatic productions are huge whole school events and every single member of our school community supports them in some way and for this, we are extremely grateful. We hope that, when you come to Notre Dame, you will want to take part in our productions and we can assure you that you will be made very welcome and, if you decide to take part, you will potentially create some of your best memories of your time at Notre Dame High School.